Wastewater Engineers, Inc. is pleased to announce a breakthrough in Oil Removal technology. Our LOR and OR series of oil coalescers will remove up to 97% of free oil on a single pass. Engineering and design breakthroughs have provided outstanding performance and dramatic improvements in fluid management. Your LOR Series Coalescer will help extend the life of your metalworking fluids by removing mechanically mixed and floating contaminating oils as well as solids from your charged systems. The various flow capacities between models allow the LOR Series Coalescer to better match your needs. The LOR Series are constructed of mild steel and are portable, so that they can be moved to and from different machines. With a floating skimmer in the machine tank/reservoir, the Coalescer pumps the contaminated fluids using a positive displacement supply pump (1/2HP, 1725r.p.m., TEFC, C-Faced, One phase-115/230 volt) through a pre-filter bag for solids removal and into the Coalescer tank. As the tank fills, the contaminated fluids pass through a filter media pack, allowing the contaminating (waste) oils to separate from the metal working fluids and rise to the top. The waste oils then flow into the discharge weir and are gravity discharged to a suitable container while the clarified metal working fluids gravity discharged back to the machine tank/reservoir. (3.) 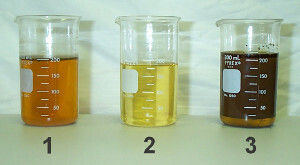 Shows the discharged tramp oil, pulled out of the fluid. Also notice the minimal percentage of water in the container. This customer has extended sump life from once-per-month dumping to over (6) months and still running! He’s saving coolant, reducing down time and haul away charges.